The Increasing Militarization of America’s Police Forces: Form of Oppression or a Protection for Society? In the year 1997, two heavily armed men entered a Southern California bank and began their reign of terror. Armed with automatic weapons, body armor, and ski masks, the two individuals forced their way into the bank and created a chaotic scene in order to get their money. As Los Angeles Police Officers responded, many of them were outgunned as they didn’t have the proper resistance (weaponry) to take on the suspects at large and protect the civilians around them (Orlov, 2012). With responding patrol officers only armed with semi-automatic rifles and 12 gauge shotguns, they were for a long time losing the battle that ended in dozens of officers and civilians injured. From this day that put all of North Hollywood, California in panic mode, police departments started providing semi-automatic rifles (M-16’s) to patrol officers, as well as increasing their use of Special Weapons and Tactics Teams (SWAT) (Orlov, 2012). This sense of ramping up increases in military like models has somewhat divided the country regarding whether to militarize our nations police forces or to demilitarize them. Some argue that equipping police across the country with military graded equipment leads to a totalitarian state with too much power and control of the government/ authorities, while others argue that equipping our police force with whatever they need is essential for the safety and protection of our communities; especially faced with an ever changing threat from those who wish to cause harm to civilians. Despite the appropriate increase of militarization to the combat criminals who pose as lot of risk, paramilitary group been seen to cause a lot of harm with their aggressive tactics; often leading to frustration within the community they are meant to serve. 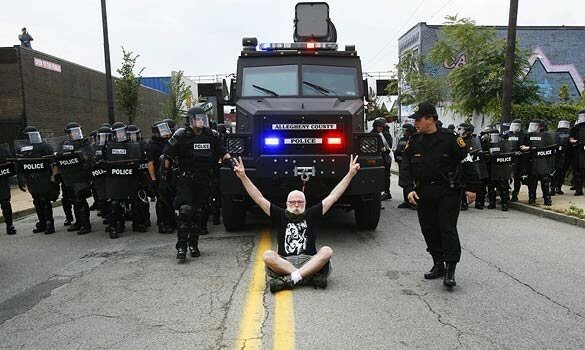 Thus, the militarization of police should not be used immediately, but rather only be used in dire situations. Ever since the Drug War era and the War on Terror, America’s law enforcement agencies have ramped up militaristic approaches and have led to a warrior ethos philosophy for officers. With a moral panic spreading across cities looking to put a stop to the selling and use of illicit drugs, the government stepped up its funding towards law enforcement hoping to create a deterrence. With many of these law enforcement agencies stepping up its presence in communities across the country, they created more specialized units; trained to handle the problems with strict guidelines of power and enforcement. The Drug Enforcement Agency and many other federal and local agencies put more funding and focus towards units that would rely on a forceful tactic of element and surprise to counter-act crimes (mostly dealing with drug offenses). These specialized unites (SWAT) would often force their way into homes (with body armor, assault rifles, flash-bangs, and a determined mindset to ravage these houses) of suspected drug users and dealers. More communities across the country (mostly poor minority communities) are experiencing heavily armed SWAT teams raiding people’s homes in the middle of the night, often just to search for drugs (ACLU). These police officer’s mindsets of a warrior mentality are often linked with the governments philosophy of “tough on crime.” However, for a lot of these cases the offender didn’t even present a violent offense. Last year (nationwide) police arrested 1.6 million nonviolent drug offenders (Stamper, 2011). Some of these non-violent drug offenders were taken into custody from SWAT teams assaulting their homes. The mere fact that these people presented no danger (based on intelligence gathering) make these dramatic invasions of the home unnecessary, as well as creates a traumatic experience for the people inside. In very shocking cases of SWAT team raids gone wrong, communities see that wrong houses are hit, as well as innocent people and family pets are shot and killed by the police raiding the homes. (Stamper, 2015). Problems like these where you have non violent offenders facing up against heavily armed men breaking down their doors, along with innocent people/pets getting killed creates an image of a public-safety institution (the authorities/police) at war with it’s own people. The year 1997 also brought along an updated program, known as the 1033 program (created under the National Defense Authorization Act). This program essentially allowed for the United States Department of Defense to transfer military-grade gear to civilian law enforcement agencies across the country because of the Iraq and Afghanistan war winding down. Through this program, agencies (including ferguson-area authorities) were able to acquire heavy body armor, semi-automatic rifles, armored vehicles (MRAPS and BearCats), grenade launchers, riot gear, tear gas, wet weather gear, and blankets (Fox & Cook, 2014). Through this increase in military style equipment, law enforcement agencies starting using them on a daily basis in order to maintain law and order on city streets. Even though officers use a lot of the equipment for their own safety (officer safety), they have been seen to use it incorrectly and inappropriately. As the Ferguson events were unfolding, the whole area had been on high alert which prompted authorities to shown in force. However, the only problem was many of the protests at the beginning were peaceful and really only needed a uniformed police presence (without the military gear and warrior mindset) to monitor their constitutional rights of free speech, as well as the right to assemble peacefully. After this chaotic scene of what seemed like the people vs. the police, the Department of Justice released their report on the Ferguson Police Department. The DOJ expressed that the police agency had handled the situation in the wrong manner (Reilly, 2015). They described that scene where police snipers were on top of armored vehicles, pointing their weapons at the crowds of peaceful protesters (Reilly, 2015). Many in the community saw these officers as attempting to intimidate and threaten the public they are meant to serve (Reilly, 2015). It’s very hard to understand that the men and women who swore to protect and serve are the same one’s seen on images and video’s already in confrontational tactical positions, as if they are ready to strike protesters (who want to freely express their opinions so that society can advance) at a moments notice. 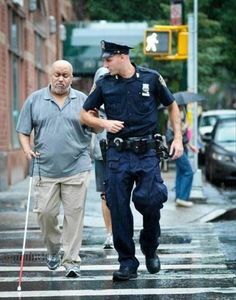 Police are meant to diffuse situations and have taken on the role of solving problems that get in the way of peace. However, recently in our history we have seen those in police uniforms escalating confrontations with their equipment, tactics, and demeanor (Baker, 2011). By playing the role of a warrior in the streets, it really hinders the chance to build ties with the communities they are meant to serve. America’s law enforcement agencies have such an essential role in protecting and serving the people of the United States. Along with their role of making sure communities feel safe, they are also meant to facilitate protesters who have the right to the freedom of speech, and to assemble peacefully (Library of Congress). However, recently we have seen an increase of the militarization of our police departments, that have infringed people’s rights and civil liberties (especially those who are protesting). When you have peaceful protesters lined up, the officers job should be to dress in non-riot gear, but should instead have it in their cars on hand (in case things get out of hand and escalate). The image of officers lined up in heavy gear with assault rifles presents an extreme intimidation (especially to the majority of protesters who are there peacefully) and causes an escalation of the protests to become violent. Even though officers claim that the paramilitary style tactics and military model help with deterrence and officer safety, it doesn’t help with building community ties; especially when those paramilitary groups seem to be up against the majority of the community. This is not to say that we shouldn’t have paramilitary groups (heavily armed officers) since those special units are needed for emergencies. The men and women who are placed into these specialized groups should be trained well to balance stability and order, along with respecting the rights of individuals. These paramilitary groups should be used as the last resort (when situations escalate) so that the community knows police diplomacy was tried; but failed. At what point in situations do police need to resort to militaristic approaches? Should tear gas and rubber bullets be used to disperse crowds? From the events of Ferguson, do you think the police in the area infringed upon the masses civil liberties and constitutional rights? How does a police officer balance officer safety while not infringing upon individual’s civil liberties and individual’s rights? At what point does an assembly of protesters become unlawful? Do police departments have too much discretion at declaring an unlawful assembly? Do you think the police are seen as more of oppressors or people looking out for public safety? After thinking about Ferguson, Occupy Wall Street, and other movements, should police departments keep military gear/ vehicles on hand? Should this military gear be made visible to act as a deterrent to those wanting to cause harm? Do you think we should have the 1033 program still in place (considering police agencies get the proper training)? Do you think America’s police force (local, state, and federal) has the most militaristic approach towards crime compared to other countries? Do you think there is any situation where you believe the militarization of police should be used immediately; as an immediate force of action (EX- Martial Law)?